Faster, better, cheaper – pick all three? Uplogix has some clear benefits for managed service providers to deploy gear faster, manage it better, and control costs while hitting their SLAs. For example, Uplogix is working with one of the top carriers in the world to deploy and manage services for a large federal customer. They are using Uplogix throughout the customer life cycle as an out-of-band solution plus much more. 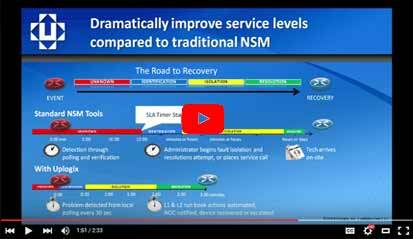 Ensuring high availability and performance for customers with geographically distributed networks and multiple remote locations presents a number of unique management challenges for MSP staff. Since it’s not possible to be onsite everywhere, network device errors often require expensive support calls and drive missed SLAs. 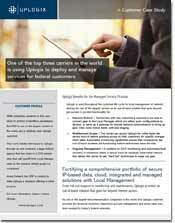 Uplogix drastically reduces the cost and complexity of supporting highly distributed IT environments. Uplogix Local Managers (LMs) enable MSPs to remotely monitor, manage, and control network equipment on the customer’s premise—even when the network is down. From the Uplogix Control Center, operations staff can centrally manage multiple customers’ networking, communications and other IT devices connected to Uplogix LMs via a simple, web-based interface with multi-tenant capabilities. With Uplogix, MSPs can also give their customers the added value of secure out-of-band access to their network infrastructure at all times. Uplogix saves MSPs significant labor costs by displacing mundane daily maintenance tasks and reducing the dispatch of costly, limited IT personnel to remote customer sites. Uplogix augments existing network & systems management with a unique ability to not only alert, but to take immediate local action to remediate issues. CASE STUDY | One of the top three carriers in the world is using Uplogix to deploy and manage services for federal customers. With Uplogix, we’re able to deliver an unmatched class of service for both traditional heterogeneous IP devices and RF communications equipment, bringing better business value to our customers. Simplify remote management | The Uplogix Control Center can be configured to support and manage multiple customer environments via a multi-tenant model. MSPs can offer customers the added value of secure out-of-band access to their own remote sites through the Control Center. Reduce support costs | Uplogix LMs work like on-site virtual IT administrators capable of anticipating/diagnosing problems and executing recovery actions in minutes or even seconds for less staff interaction and fewer tech support trips to remote locations. Maintain and improve service levels | Uplogix can proactively find and fix problems before network performance is severely impacted. The Service Level Verification features can monitor, measure and manage critical network and communication services including TCP/IP, web-based transactions, and voice over IP systems from each remote location — mirroring the network performance users are experiencing. This data can feed alerts and automated actions. Reduce security risk | By constantly enforcing security policies by providing encrypted access to all managed devices, Uplogix enforces authorization and authentication policies. All user interactions and configuration changes are record for auditing — even during a network outage or service disruption.